Lotsa Candies: Make lots of polymer clay candy corns (instructions here). Then use them to make a fun frame, geometrical magnet, or even a nature-inspired centerpiece. Flattened Candies: Crafty This & That has instructions for making very cute felt candy corns. Try using her pattern to make a polymer clay version, complete with antiqued faux stitching. You can make your own eyes, or just glue on googly eyes after baking. Big Candies: Make a polymer clay candy corn shelf-sitter. I like the jute-style legs in Joshua Burkhardt's Hangin' Around With Noah. Try making color-matched buttons (here's instructions & a video) as perfect little candy corn feet... check out the queen's frames if you need button inspiration. These would make a perfectly sweet decoration for any shelf! Here's hoping you have a crafty weekend full of yummy-looking goodies. I should warn you, though. 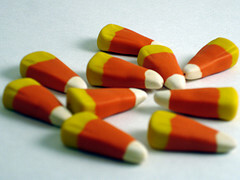 Polymer clay candy corns may seem like a low-calorie way to keep these festive candies around. And it could just be me. But it seems like the longer I work with the faux candies, the more likely I am to break open a bag of the real thing! Three fun ideas for using polymer clay candy corns in your Halloween decor.